LucidControl IO Modules consist of a collection of different input and output devices for analog and digital data acquisition and control that can be used in numerous monitoring applications. The USB Analog Input Modules are very affordable and also ready for portable applications because of being Universal Serial Bus power supplied and there are no extra power supplies needed. It is sufficient to hook LucidControl modules via a ordinary Universal serial bus port to the computer. Most OS like Windows as well as Linux are working with LucidControl USB input output devices instantly without driver software setup. Beside of ordinary computers LucidControl Universal Serial Bus I/O modules are also compatible with micro-sized computers such as the TI Beagle Bone Black what makes the I/O devices most usable. This offers all capabilities provided by input output devices being available through the internet and to realize database applications on embedded computers operating with Linux operating system. Due to an complete documentation, high quality programming tools and APIs for several important programming environments and also their easy use make the units the right automation solution for newbies as well as for experts. Trainees can make their first automation programming steps with LucidControl and benefit from a steep learning curve. The versatile and DIN-Rail mountable housing makes the USB IO Modules best suitable for the automation branch because it enables their most easy inclusion in switch boxes. 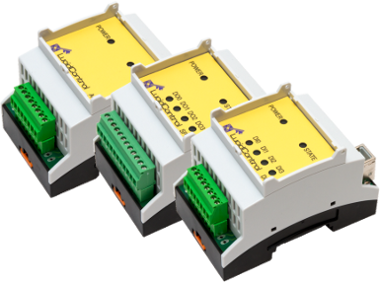 Moreover, the USB IO Modules are supplied with most reliable and plug-able terminal contacts being beneficial for applications in general. Applications covering e.g. controlling lights that are very common in the do it yourself field can be made tidy and straight forward by integrating the equipment into distribution boxes. 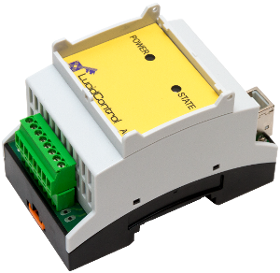 LucidControl analog acquisition and USB Output DAC Modules represent a group of input and output units that are ready to manage analog signals such as currents. The acquisition of analog signals can easily be realized using the USB Analog Input Module. The analog input channels are available in order to measure positive as well as negative input lines in the values of 5V, 10V, 24V as well as the negative values of -5V-5V, -10V-10V and -24-24V. Especially analog interfaces of 0-10V and 0-24V are typically chosen in the building area. Usually used detectors e.g. wind detectors create 0-10V channels where the measured voltage is relative to the metered wind velocity and hence the 0-10V interface of the USB Analog Input Module is best suited to work with such equipment. Flow sensors for instance provide analog voltage signals relative to the mass of fluid flew through them per time division and the USB ADC Module is able to manage these dimensions. A high resolution of 14 bit grants a precision of 0.25% over the entire measurement range of the USB Analog Input module. The precision of the digitalized line is additionally improved by the internal signal conditioning stage and the disturbance filter. Concerning precision the 0-10V selection of the USB Analog Input Module captures an applied voltage signal with +/- 25mV tolerance which is a good trade-off regarding price and accuracy while being sufficient for plenty monitoring tasks. In order to make this product as helpful as realisable and also to manage most possible uses, it is our firms objective to manage a number of digital and analog signals with our USB IO Modules. Visit our website in order to find extra details about the LucidControl Universal Serial Bus I/O units.